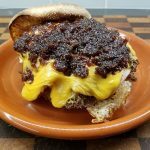 Bacon Jam with Onion Garlic Coffee Balsamic Brown Sugar Maple Syrup | What Goes with What? Bacon, egg, cheese and bacon jam breakfast muffin. In a large skillet over mediumish heat, cook the bacon, stirring occasionally, until the fat is rendered and the bacon is lightly browned, about 20 minutes. Using a slotted spoon, transfer the bacon to paper towel-lined plates to drain. Pour off all but 1 tablespoon drippings from the skillet and reserve for another use. Add the onions and garlic to the skillet and cook until the onions are translucent, about 6 minutes. Add the coffee, vinegar, brown sugar, and maple syrup and bring to a boil. Cook, stirring and scraping up any browned bits from the skillet, for 2 minutes. Add the bacon and stir to combine. (Follow this part closely) Reduce the heat to a bare simmer and cook uncovered, stirring occasionally, until the liquid almost completely evaporates and turns syrupy, 1 to 1 1/2 hours. Watch closely at the end and you’ll know when it turns to the right consistency. Let the bacon concoction cool slightly before transferring it to a food processor and pulsing until coarsely chopped. Spoon the bacon lusciousness into individual jars or other resealable containers and refrigerate for up to 4 weeks. Transfer the amount you will be using, more than you think to a pan and rewarm gently over low heat or pop in microwave for a few moments prior to indulging. Join our mailing list and receive periodical updates, recipes and wine suggestions straight to your email! © Copyright2019 What Goes with What?